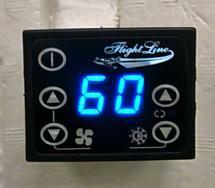 Flightline AC announces the release of our new Climate Control feature, the CB-1. The CB-1 (Cool Blue One), is the first generation of low cost automatic climate control features that offer thermostatic control of your air conditioning system to balance and control your inside cabin air temperature automatically. This little unit measures 2.25" X 1.875" on its' face. The system can operate up to 3 fan speeds, open and close a heater valve as well as a fresh air or cabin flood vent. The temp range is for IAT of 60' on the low side and 90' on the high side and this is measured at the return air to the evaporator assembly to maximize the saturated balance of the sytsem. This unit can be purchased with a complete Flightline AC system for your experimental aircraft at a discounted price or the CB-1 can be retrofitted into any Flightline AC system as well as most standard VCS's (Vapor Cycle Systems) offered to the experimental market by our competitors. The unit comes complete with wiring diagrams, pin connectors, relays, thermistor bulb, and instructions for operation. For more information call or write and we'll be glad to answer your questions and process your order. 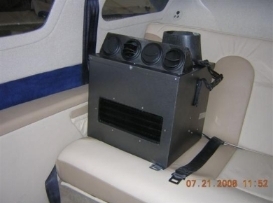 Flightline AC portable air conditioning for GA aircraft.